The workers who put poultry on your table are subject to horrible conditions on the job. You need to be brave to work in the chicken business—you’re bombarded with bloody carcasses, stung by spurting chemicals, and menaced by gnashing blades that stop for nothing no matter how tired you are, or how much blood is spurting from your hand. According to the Occupational Safety and Health Administration (OSHA) citation, which imposed $78,000 in proposed health and safety-related fines on a Pilgrim’s Pride plant in Florida, management systematically failed to refer injured and sick workers to proper outside medical treatment, “which could result in health hazards [like]…prolonged healing, exacerbation of pain, and limited recovery” from injuries on the job. In February, a worker lacking a proper safety shield reportedly received chemical burns when handling a water chiller, resulting in “a caustic liquid sprayed back in his face.” A lack of facial protection also exposed a workers’ eyes to a “chemical splash” and “zoonotic diseases” during mass bird slaughtering. The management also botched an on-site pollution monitoring test and failed to record 16 work-related injuries or illnesses in 2015. 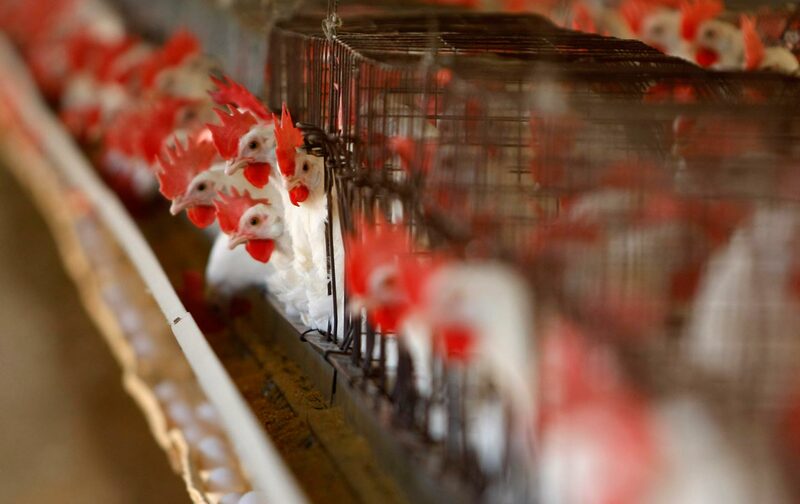 Every day, low-wage poultry factory workers risk getting slashed and throttled by machines and burned by chemicals, scrambling to cut and pack up to 140 carcasses per minute. The industry claims it upholds strong safety standards and is improving through technology. But Oxfam’s recent joint investigation with Northwest Arkansas Workers Justice Center revealed how another major chicken producer, Tyson, has upgraded Upton Sinclair’s The Jungle for the neoliberal economy, with brutal pressure to hit hyper-mechanized production quotas, often at the expense of workers’ health. About half of workers surveyed reported suffering injuries on the job, ranging from lacerations to toxic exposures. Fewer than half said their safety training was adequate; many complained of inadequate safety gear. Just one in 10 had access to paid sick leave. Even unpaid leave was often rationed using “a points system that discourages workers from taking time off.” About six in 10 respondents said they could afford to pay for medical care only “sometimes” or “never,” evidently leaving workers to rely heavily on spotty in-house clinic services. Debbie Berkowitz, senior fellow for Workplace Safety and Health with the National Employment Law Project and a former OSHA adviser, tells The Nation that the OSHA warned of these problems throughout the industry as early as 20 years ago (and recent Government Accountability Office research affirms this), but companies have failed to systematically reform. The Florida citation, for example, echoes a 2014 investigation of an Alabama plant showing that nurses at the ill-equipped first-aid station forced workers to visit up to 94 times before finally getting referred to a regular physician. The toxic workplace climate deepens the pain. The Arkansas workers described suffering retaliation for reporting health or safety violations, in an impoverished workforce already wracked with anxiety over threats of deportation and frequent wage theft. There were reports of rampant workplace sexual and verbal abuse, and racial and gender discrimination among all groups. Roughly half of workers reported experiencing discrimination, with especially severe rates among Latinos, who, unsurprisingly, also suffer some of the highest rates of injury. But while workers fear the boss, the boss isn’t totally fearless. About 90 percent of surveyed workers said that they were “treated differently during OSHA inspection.” The management’s responsiveness suggests that when the law seriously intervenes, the industry does listen, at least temporarily. And despite the social barriers, workers do muster the courage to defend their workplace rights. About 40 percent of Arkansas respondents said “they or a coworker have previously spoken up to a supervisor about health and safety issues or other conditions of the workplace.” Despite risk of retaliation, about half the time supervisors were said to be responsive about their grievances. The need for organization, therefore, is critical. One thing that distinguished the Florida plant and was likely instrumental in triggering federal intervention was the presence of the union, United Food and Commercial Workers—in an industry where unionization is perilously low. Effective OSHA inspections depend on active involvement of workers. They are, after all, the eyes and ears in a worksite. But without the protection provided by a union, many workers fear talking to an inspector (or are outright told not to). When a worksite’s eyes and ears are assaulted with acid burns and degrading abuse, workers need the protection of the law to survive, and the support of a movement to stand up to the boss before the kill line culls another life.